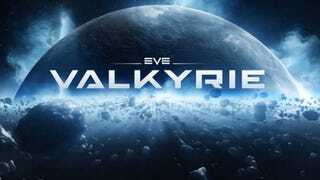 EVE Valkyrie—or EVE-VR, as it was known this time last year, when it was just a tech demo made for developer CCP’s annual gathering of internet spaceship pilots, EVE Fanfest—has come a long way in a year. What was once an impressive, fun demonstration of virtual reality space-fights is now close to an actual game. It’s now got a story, it’s got Starbuck from Battlestar Galactica starring in its leading role, it’s got different ships and loadouts, it looks jaw-dropping. And it remains, in my admittedly still limited experience, the most natural, effortless fun I’ve had with virtual reality. Slip on the headset, you find yourself sitting in a cockpit, ready to launch out into space, and it’s immediately obvious what you have to do: fly and shoot. When you shoot out of the supercarrier and into wide-open space, suddenly you can move your agile ship as well as your head, spinning and barrel-rolling, braking and boosting away from missiles. Looking left and right, I could see the barrels of my ship’s sidearms spinning as they pumped out space-bullets. The UI changes as you move your head around, with little blips tracking enemies and your own head position. There’s a lovely revolver-style missile lock on, letting you fire up to five of them at once if you can keep the enemy in sight as you manoeuvre your own ship. It feels amazing to look over your shoulder and fire a missile at a fleeing fighter. It’s looking much more like an actual game than it was last year, with slick visual and audio effects. Getting hit is exciting—you can hear cannon fire ricocheting off your hull, the missile lock alert beeps urgently, the glass of the cockpit splinters and cracks, and missiles land with a shuddering crash that really shakes the craft. The new engine and new Oculus hardware between them make for a much better-looking experience. In previous builds of Valkyrie, the missiles have been rather overpowered. You’d die pretty frequently, and get frequent kills as well. This new build made me work much harder, both whilst evading and when chasing someone down. Ships can take four or five missiles without going down, and have anti-missile guns that can shoot threats out of the sky with good timing. You could pretty much ignore the primary guns in the original demo in favour of missiles, but now that doesn’t get you far. It certainly feels more tactical, but it’s lost some of that arcadey feel. It hasn’t lost the simple controls and amazing sense of immersion that helped it make such a good impression last year, though. I was worried that CCP might overcomplicate things (this IS the studio behind EVE Online, probably among the most complicated games in the entire world), but Valkyrie is clearly intended to be easy to play. There’s no intimidating interface between you and your Luke Skywalker/Kara Thrace fantasies. Speaking of fantasies, EVE Valkyrie now sports a story. If you’re not into EVE, none of it means much right now, but Sackhoff plays the captain of the Valkyrie pilots, who were once genetically engineered clones created by the EVE universe’s pirate faction, the Guristas. Now, they are rebels in space. Sackhoff—or Ran, as her character is called—is the voice in your head, the person barking commands. The demo is a three-vs-three dogfight limited to one ship, but in the final game there will be three “roles” (CCP is desperate not to call them “classes”): fighter, heavy and support, each of which has different movement and weapons that will hopefully add more tactical options. Right now, EVE Valkyrie is tremendous fun, but there’s little room for strategy; it’s all about aggressive shooting and nimble flying. What flying, though. Valkyrie is stunningly immersive. It is as close to actual space dogfighting as any of us are ever likely to get. When I looked down and caught sight of my armour-clad body in the cockpit, feet planted in front of me and hands on the controls, it felt for a second like it might actually be mine. It feels so exciting. EVE Valkyrie has the potential to be VR technology’s Wii Sports moment: the simple, exciting, accessible experience that immediately shows people what virtual reality can offer. If CCP can get it out in time to ride that early-adopter wave, it could become an early flagship game for these new platforms. The implications for CCP and the EVE universe would be huge.